The Kaplan Center is right on top of the latest trends and treatments, telling patients what new medicines or procedures are on the horizon that could bring relief to chronic pain problems. — G.W., Patient with fibromyalgia and chronic fatigue. If only there was a single pill that could resolve your chronic pain. The reality, however, is that the causes of chronic pain are multidimensional, and effective treatment requires a multidimensional approach. At the Kaplan Center for Integrative Medicine we offer patients a unique diagnostic protocol — taking the time to talk with patients to understand their symptoms, their medical history, which treatments have and haven’t worked in the past, and reviewing patients’ musculoskeletal, physiological and even emotional systems. 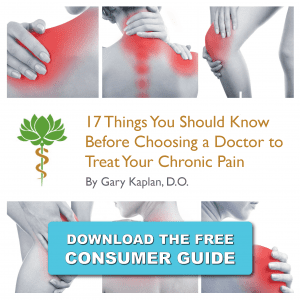 Once accurately diagnosed, we find that patients with chronic illness make the quickest and the most complete recoveries when they follow a comprehensive treatment strategy that addresses their unique medical needs. By combining treatment modalities in a way that specifically targets an individual’s medical issues, our patients are able to achieve a more rapid, complete, and permanent resolution of their chronic illness — often avoiding surgery, using far less medication and experiencing fewer side effects than with conventional medicine. At the Kaplan Center we offer strategic pain management — a comprehensive treatment approach that may incorporate one or more of the modalities listed below. The Kaplan Center for Integrative Medicine offers patients acupuncture within the context of their entire treatment plan. Research has demonstrated that it can have direct and lasting positive effects on the body’s neurological (nervous), endocrine (hormonal), and immunological (disease-fighting) systems. In 1998, a Consensus-Conference Panel of the National Institutes of Health (NIH) found that acupuncture is an effective non-invasive modality in treating a variety of medical and pain problems, including migraines, osteoarthritis, and infertility. Read more.. Slowing down the aging process means nurturing your body on a cellular and spiritual level. We do this by using evidence-based medicine with a whole body approach which means applying scientifically proven alternative therapies to treat our patients’ physiological concerns, along with providing the emotional support that is so strongly linked to overall health. Read more.. There are a variety of treatments available to patients suffering from biotoxicity or neurotoxicity disorder, but there is certainly no “one-size-fits-all” remedy. Your treatment plan will be individually tailored after consideration of your overall medical history, your current symptoms, your genetic makeup, your history of exposure to biotoxins and your lifestyle. The essential aspect of treatment is the detoxification regime, a 2-step process whereby the biotoxins are first drawn out of whatever tissue in the body is storing them, and then toxins are bound at the molecular level so they can be eliminated from the body via urination. Read more.. In treating chronic pain, there is an important role for invasive measures, such as epidural steroid injections, the surgical implantation of dorsal-column stimulators and other surgical options. But there is also a multitude of effective, non-invasive manual treatment options available to patients, with far fewer side effects and risks. Read more..
For women who are pregnant or trying to conceive, the Kaplan Center for Integrative Medicine offers a number of strategies for optimizing a woman’s health before, during, and after her pregnancy. We recommend the following strategies to women who want to experience a successful pregnancy and deliver a healthy baby. Read more.. Using Heart Rate Variability (HRV) to gain an objective assessment of your Autonomic Nervous System is a huge advantage in gauging progress toward the ultimate goal of living longer with better health and energy. Read more.. If you have medication sensitivities, are concerned about drug interactions, or you are just interested in enhancing your health, our physicians and dietitian are happy to talk with you about the herbal compounds, nutritional supplements and some homeopathic remedies that may benefit your health and well-being. Read more..
Often we find that patients suffering from chronic pain, illness, or fatigue have been living with hormonal imbalances that have never been properly diagnosed. Read more..
LDT is a gentle way to support the body’s lymph system in removing toxins from the body and can be a valuable addition to a detox protocol (i.e. patients undergoing treatment for heavy metal or mold toxicity). Read more.. Meditation can not only have positive and rapid changes in the brain, we find that our patients who meditate typically sleep better, have less pain, less anxiety and depression, and a better general sense of well-being. Read more.. Although food provides us with both nutrition and pleasure, poor nutritional choices can lead to serious health problems. If you follow an essentially healthy diet, but still find yourself ill or in pain, you might be eating the wrong foods for your body. Read more.. In treating chronic pain, there is an important role for invasive measures, such as epidural steroid injections, the surgical implantation of dorsal-column stimulators and other surgical options. Read more.. In treating chronic pain, there is an important role for invasive measures, such as epidural steroid injections, the surgical implantation of dorsal-column stimulators and other surgical options Read more..
Our goal is to identify the most effective and least invasive means of helping you heal. For example, in treating low back pain, we have found that acupuncture, osteopathic manipulation, physical therapy and even dietary changes often can be more effective than medication or surgery. Read more.. Individuals with chronic pain and illness not only suffer physically — they often suffer emotionally. Emotional pain can range from anger and grief, to feeling emotionally numb, to clinical depression. Read more.. Patients are increasingly seeking non-surgical treatment options for orthopedic and sports injuries and Regenerative Medicine is one of the fastest growing fields in medicine. If you have sustained a tendon or ligament injury, or suffer from chronic back or neck pain, you may be a good candidate for Prolotherapy, Platelet Rich Plasma (PRP), or Stem Cell Injections, depending on your unique medical condition. Read more..
Sleep deprivation, caused by insufficient sleep or poor quality of sleep, impairs the body’s immune system, physical reflexes, emotional stability and cognitive functions. It can also lead to increased muscle, joint and nerve pain. Read more.. Trigger points are an often neglected, key cause of pain in many individuals. If you have a tender, hypersensitive part of your musculoskeletal system that causes you pain, stiffness, or limited range of motion, you may be experiencing the extremely common pain of a trigger point. Read more..
Vitamin, Glutathione, NAD+, and Magnesium IVs provide a quick and vigorous boost to patients’ immune systems, enhancing the body’s ability to heal itself and maintain its optimal level of health. The Kaplan Center’s physicians use IV Therapy for a variety of reasons. Read more..